If Belle and Beau went to school here, this sign would not be a problem. Alas, the Belles and Beaus (should this read Beaux?) Academy is for wee boys and girls. Apostrophe catastrophes: the new academic epidemic. Thanks to Ashleigh for the photo. BY WE AND BY I. Mighty Red Pen made us laugh out loud with this post about confusion that can arise when acronyms mean different things in different places. This comes from the 10-year-old son of Steven C.
SPOGG loves a child who recognizes wonky spelling. Hello, easy jokes department? Question here. 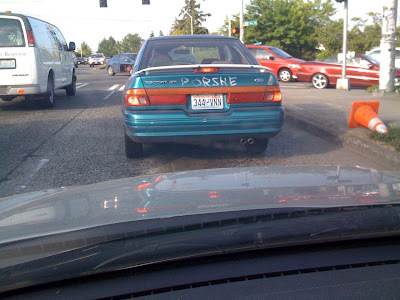 Which one's funnier--"Looks like they forgot the other 'o' in 'poorshe,' or 'can you c what's wrong with this car'? How about, 'There is no 'c' in 'cheap'?" Not one of them? OK, then. And the same to your mother! Thanks to Jaime T. for the photo. One of our Twitter friends says he overheard some dude say this. We like it, though we also like life in the plural form. "First person singular! That's where it's at, baby!" 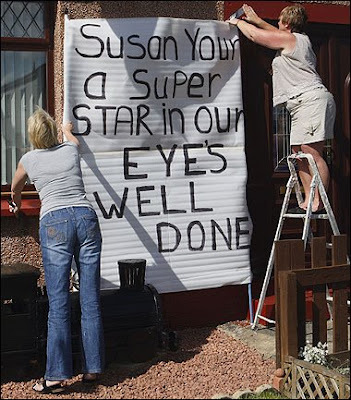 They meant to support Susan Boyle. Who will write the song to support SPOGG after we have our nervous breakdown? MANILA, Philippines – The Department of Education (DepEd) announced yesterday that a teachers’ guide would be issued to public elementary schools nationwide to correct the errors in newly purchased English textbooks. Education Secretary Jesli Lapus said the teaching guides will help correct errors of the book “English for You and Me” Grades 1 to Six series, authored by Elodie Cada and published by Bookwise Publishing, which are being distributed to public schools. “The teaching guides to correct errors in English textbooks are being finalized for printing,” Lapus told The STAR. Lapus said that a content study of the textbooks conducted last February had confirmed the errors pointed out by textbook error watchdog Antonio Calipjo-Go, who said that the books contained more than 500 errors, including grammatical and conceptual ones. The DepEd had earlier attempted to ignore Go’s claims that the textbooks were defective, saying that Go had taken many items out of context. The DepEd used a $200-million loan from the World Bank to purchase the English for You and Me series and other books, which were supposed to have undergone a thorough four-level content evaluation by education experts to prevent errors. We get his daily usage updates and often learn new and interesting things. Today, though, at the peak of the allergy season for SPOGG, we were happy (and disgusted) to learn the difference between "mucus" and "mucous." These two ought to be kept separate, "mucus" for the slimy substance and "mucous" for the adjective describing whatever contains or secretes mucus. So "mucus membrane" is a mistake -- e.g. : "If a person already has herpes, chlamydia, gonorrhea, or syphilis and is exposed to HIV, he or she is more likely to contract the virus because of openings in the mucus [read 'mucous'] membranes and skin." "Increased Research Leads to Dramatic Declines in Sexually Transmitted Diseases," USA Today (Mag. ), Feb. 1995, at 11. In medical literature, "mucous ball" and "mucus ball" are about equally common. This is a closer case than "mucous membrane," however, because "mucus ball" is a ball of mucus, and the noun is justifiably used in an attributive sense -- e.g. : "Over the ensuing six months, there has been no further problem with mucus balls, his level of dyspnea, or edema." Edward M. Harrow et al., "Respiratory Failure and Cor Pulmonale Associated with Tracheal Mucoid Accumulation [etc. ]," Chest, Feb. 1992, at 580. But the best course, outside medical literature, might be to find a euphemism. Ah, the "mucus ball." We hope your invitation was lost in the mail. Sincerely, and sniffingly, SPOGG. Stabbiversary. To learn its origins, read this fine essay on the Web site of The New York Times. Every so often, we encounter a word we've never seen before. Today, we thought we saw "punctuate" on the home page of The New York Times. Our eyes deceived us. It was "puncicate." with soccer fans in Rome. Thank you, Schott's Vocabulary. We'd say this vocabulary enhancement is a real shot in the arm, but, well, that might be missing the point. You might have to click on this to make the text legible, but it says "Your a genius!" It goes on to say "If you needed to read this to figure out what that is, now your dumb." Ah, sweet irony. Thanks, Facebook. 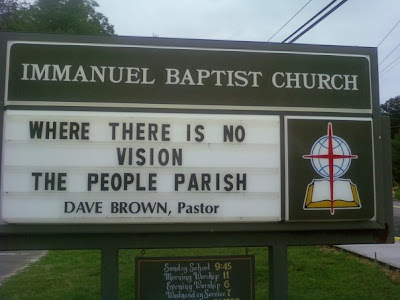 Thanks to Meredith for the image. Q. You've taught in community colleges for 16 years. How do you define success? A. Success is when my students have developed confidence and self-esteem that can help them achieve their goals. It's important that they can write a research paper, structure a logical argument in writing and determine when to use a comma versus a semicolon, but most important is that they emerge with a sense of confidence.